Last revised 15 September 2008. Because the Moon has no atmosphere and no clouds, the temperature at a given time and place on the lunar surface can be predicted with accuracy and long in advance. It depends primarily on the site's latitude and longitude and on the Sun's position in the local sky. For equatorial sites, temperatures can range from about 104°K (-169°C) just before sunrise to about 390°K (117°C) at noon. At high latitudes, shadowing and other factors become important. The Apollo crews landed when the Sun was low in the eastern sky, a configuration that gave good shadow definition of the landing site terrain. Solar phase angles (0 degrees at local sunrise, 90 degrees at noon) at landing ranged from 4.7 degrees (Apollo 12) to 14.7 (Apollo 16). The last three crews stayed for considerably longer than the others and the phase angles at EVA-3 termination were 45.6, 48.6, and 43.1 for Apollo 15, 16, and 17, repectively. Temperature measurements made with thermocouples positioned within a few centimeters above the surface are available for Apollo 15 and A17. As indicated in the following figures, temperatures at EVA-3 termination for those two missions were about 342°K (69°C) and 325°K (52°C), respectively. The vertical blue lines indicate the phase angles at EVA-3 termination. 167:19:47 Duke: Boy, it is hot out here today, I'll tell you. [Duke - "I was running more in Intermediate (cooling); and I could feel a hot spot...The right (side) PLSS strap was tight, compressing the insulation in the suit, and I could feel the Sun in there. With the higher angle (46 degrees at the time), we were running mostly in Intermediate, here." Careful thermal design of the suits and other equipment ensured that, with some minor exceptions discussed below, the missions were completed without adverse thermal effects. In particular, the multi-layer design of the suits ensured that the amount of heat that leaked into the suit from the lunar environment was small compared with the metabolic (body) heat the astronauts generated as they went about their work. The use rate of cooling water - and oxygen - was determined primarily by the work load: highest when the astronauts were doing physically demanding tasks, lowest when they were riding on the Rover. Unfortunately, the only water use date available is the total for each EVA; but the astronauts often reported their cooling settings. These reports, along with other indicators of metabolic rate, indicate variations in water use rates at various times during the EVAs. In the case of Apollo 16 EVA-3, despite the high sun angle and Charlie's use of Intermediate cooling for about 3 hours 33 minutes of the 5 hour 40 minute EVA, his total water use for the EVA wasn't particularly high. "Back toward Min(imum). I'm getting a little frosty." "Tony, I tried some Max cooling there for a second, on this PLSS, and it really freezes you." Almost certainly he immediately (coudn't resist it) went back to Intermediate. During the 5 hr 40 min EVA, Charlie spent about 3 hr 33 min at settings higher than Minimum but probably not higher than Intermediate. A few seconds at Maximum cooling was much too cold. John didn't report his cooling setting very often during EVA-3. Oxygen and feed water use during EVAs 1 and 2 on Apollos 16 and 17 are presented in the following table. The EVAs are listed in order of increasing solar phase angle The first EVAs are not included because they were dominated by labor-intensive ALSEP deployments. None of the Apollo 15 EVAs are not included because of the extra work done on drilling tasks during all three EVAs. As long as the astronauts had their cooling controls set so that they were comfortable, oxygen use is a measure of metabolic rates. Water use is a measure of the heat - both metabolic and solar - which had to be dealt with by the cooling system. The ratio of water use to oxygen use is a possible measure of the relative importance of the solar heat load on the cooling system. Apollo 16 EVA-3 doesn't not appear have exceptional ratios. 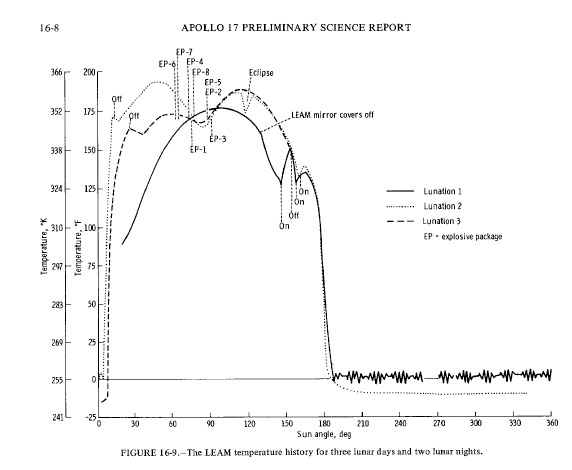 Thermocouples attached to surface cables on the Heat-Flow experiment successfully deployed on Apollo 15 and 17 provide the primary surface temperature measurements (discussed above) obtained during Apollo. Other temperature measurements were made, but require more interpretation. They are listed in the following table. In addition, rough temperature measurements are provided by Tempa-labels attached to various pieces of equipment. Each Tempa-label consisted of four patches of materials that changed color when its temperature exceeded certain values. We are not aware of any post-mission analyses, nor have we yet attempted a listing of Tempa-label reports. 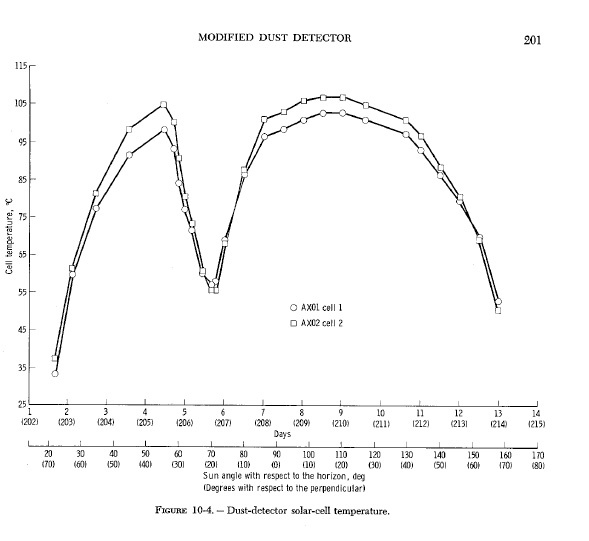 EASEP Dust, Thermal, and Radiation Engineering Measurement Package. This package included two temperature sensors. The dip in the measurements before local noon was the result of shadowing by other parts of the EASEP. According to the experimenters, this shadowing may have casued the maximum value recorded to be about 5 to 10° C less than what would have been measured had the shadowing not occurred. 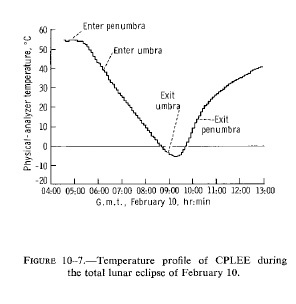 Temperatures measured in the CPLEE physical analyzer during the total lunar eclipse of 10 February 1971. This temperature measurement was made inside the experiment housing. At the time the Moon entered the umbra of the Earth's shadow, the Sun's elevation was 69 degrees. 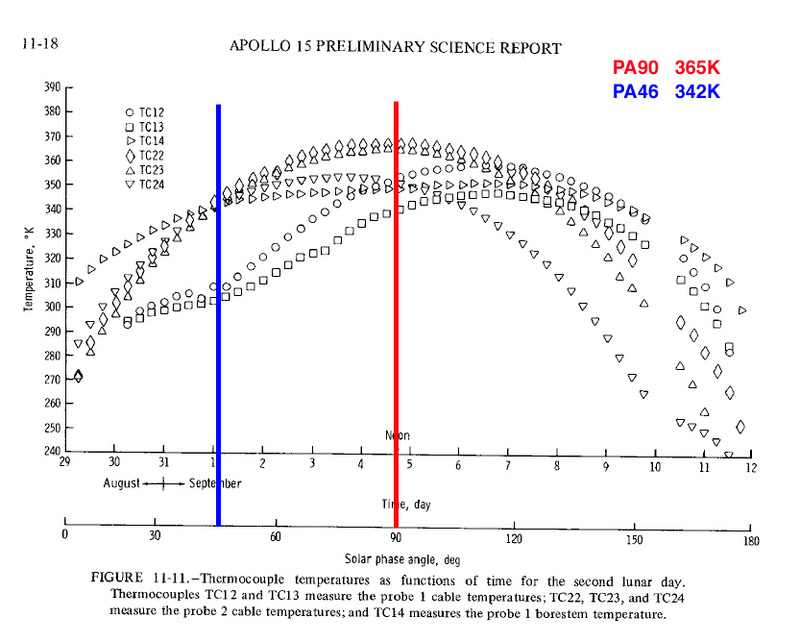 Surface brightness temperatures deduced from the thermocouple data taken during the first lunar night after deployment. The model curves show the effect of assumptions about the conductivity of near-surface regolith. 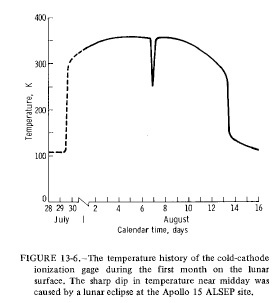 Temperature history of the Cold Cathode Ion Gauge for about sixteen days after activation at 19:34 GMT/UTC on 31 July 1971. 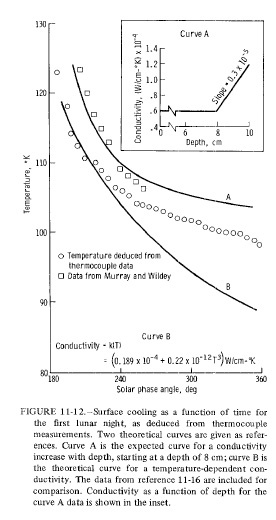 Surface temperatures derived from thermocouple measurements on the surface cables. The times of EVA-3 termination and local noon have been indicated. Approximate temperatures for those times are given in the legend. 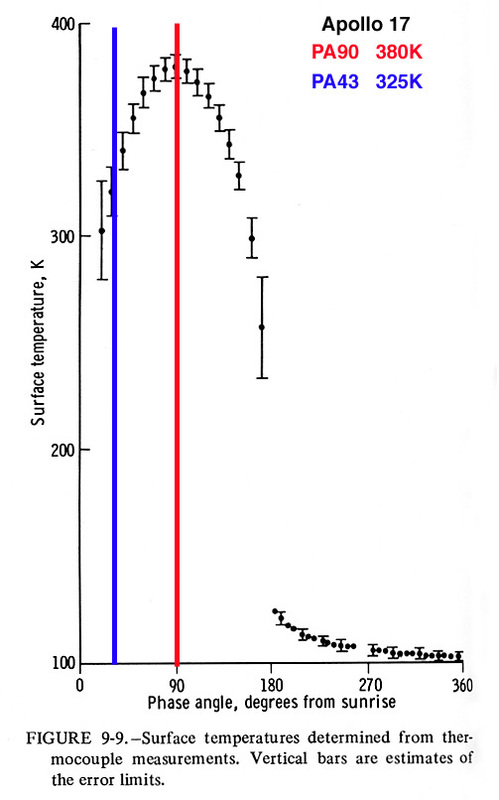 Temperatures in the Lunar Ejecta and Meteorites experiment. The explosive packages deployed by the crew were detonate at the indicated sun angles during the first lunation, beginning about 24 hours after LM liftoff. The LEAM mirror covers were not removed until well after the last of those detonations. Differences between the temperature profiles measured on successive lunar days are ascribed to dust accumulation at local dawn and sunset. Evidence for signifcant dust lofting at those times is not yet compelling but, clearly, the LEAM temperatures should be used with caution. See a discussion in Section 15.4.3 in the Apollo 17 Mission Report. Critical piece of equipment such as the TV camera, the Lunar Communications Relay Unit (LCRU), and the batteries had radiator mirrors and/or thermal coverings. The crews dusted the mirrors regularly and opened or closed covers as requested by Houston. Further discussion will be presented in WOTM Chapter 3.2.6. Objects that sat out in the Sun for long periods of time could get warm or even hot to the touch. Examples include the Hand Tool Carrier that Al Bean lugged around on Apollo 12 EVA-2; the Apollo 15 EVA-2 rockbox that was in full Sun for most of the EVA; and the Apollo 16 Cosmic Ray Experiment, which was purposefully positioned facing the Sun early in EVA-1 and wasn't retrieved until late in EVA-3. Did not experience anything that felt either hot or cold to the touch. Armstrong (from the Tech Debrief) - "There weren't any temperature effects noted in the egress or (on the) ladder. Nothing felt hot or cold or had any temperature effects at all that I was aware of." Aldrin (from the Tech Debrief) - "In confirmation of Neil's findings, I didn't experience any hot or even warm spots in the suit." Bean (from the Tech Debrief) - "I did notice, however, that you could feel the heat radiating from the RTG. When I removed the bracket that carried the power cable that ran from the RTG to the Central Station, it felt warm to the touch. I didn't want to keep my fingers there too long, so I handled it with the ALSEP tool (UHT) as opposed to just my gloved hands, as I had been doing in practice. Apparently that bracket can get pretty hot, although we only had the element in it a short time." Conrad (from the Tech Debrief) - "I guess the point is, when you fuel that generator, you had better get on the road and get going to wherever you are going to take it. You should get those parts off the fuel element as soon as possible, because they heat at quite a high rate. noticed as we worked was that, whenever I held onto metal tools for any length of time - anything shiny like the extension handle, the tongs or, later, during the second EVA, when I was carrying the Hand Tool Carrier - my hands would get warm. If I would put them down and remove my hands from them, my hands would get cool again. It was not too hot to handle; it was just the fact that I would notice they started to warm up." See, also, real-time discussion during EVa-2 at 133:15:10. At the end of EVA-1, they put the EVA-2 rock box in the Sun in the north foot pad to keep the seals warm, but covered it with the S-Band thermal protection blanket. "We didn't want it to get really hot." shows the rock box on the MESA and in sunight. Dave touches something that feels hot. must have been pretty hot." Houston is concerned that, once they get back in the cabin and get their gloves off, Charlie's OPS may be hot to the touch. Once they are back in the cabin, Tony reminds John of the possibility as he's taking his gloves off at 150:05:56. John reports that the OPS is "cool as a cucumber". John mentions that the plate on detectors in the CRE won't pull out of its frame. This was undoubtedly due to thermal expansion. At 170:08:02, as John and Charlie are each holding an end are trying to pull the CRE apart, Charlie can feel the heat through his gloves, "This thing is hot, I'll tell you". The circumstance suggest that it is the metal controls and fixtures on Jack's RCU. During the drive back from Station 5, the RCU's would have been in full sun. See, also, comments after 170:53:02. There were a few equipment problems due to solar heating. Only one was of consequence: failure of the Apollo 17 Surface Electrical Properties experiment. There is one instance of a piece of equipment, the Apollo 16 UV Astronomy Camera, which had a minor, cold-related problem. The clutch was designed to operate at temperatures up to 122°F (50°C) but probably experienced temperatures inside the housing of up to 180°F (82°C). The clutch was redesigned to eliminate temperature-sensitive elastomers. This anamoly is not discussed in the mission report, possibly because this design was not going to be flown on Apollo 17 and because, working together, John and Charlie managed to pull the detector plate out of its frame by brute force after two minutes of effort. The UV camera was kept the LM shadow to protect the film from high temperatures. The grease used on the azimuth bearing had not been tested in a cold chamber. Under conditions in the LM shadow, the grease stiffened and John had so much difficulty turning the camera between exposures that, as he tells Houston at 143:19:40, it was easier to pick the camera up, re-orient, and re-level it than to to use the azimuth adjustment. Temperatures measured at depths greater than about 80 cm as part of the Heat Flow Experiment show no day/night variations, because of the low thermal conductivity of the soil. Temperatures measured a 100 cm depth were about 252°K (-21 °C) at the Apollo 15 site and 255°K (-18 °C) at the Apollo 17 site. As mentioned by the authors of the Lunar Sourcebook, "a lunar habitation buried beneath a thick regolith radiation shield will not be subjected to (day/night) temperature extremes but rather will have to find an efficient method for dissipating its waste heat." Section 3.5 in Heiken, G.H., Vaniman, D.T., and French, B.M. (eds), Lunar Sourcebook: A User's Guide to the Moon, Cambridge University Press, 1991, now available on DVD from the Lunar and Planetary Institute. Section 2 Chapter 4, "Metabolism and Heat Dissipation During Apollo EVA Periods", Waligora, J.M., and Horrigan, D.J., in NASA SP-368, Biomedical Results of Apollo, 1975.